We are a surface design studio producing innovative patterns for public realm, interiors and architecture projects. Our designs are informed by working closely with the client and related communities to produce creative and unexpected outcomes. The name of our company mirrors our design process, creating tailor-made pieces in our atelier, or workshop. With a background in textile design our creative approach is pattern and texture driven, focusing upon creating graphic and tactile qualities to enhance spaces. Our designs complement the environments in which they are placed, making a visual impact to suit their location. Bespoke Atelier work frequently for local councils within education and healthcare services and with private developers, heritage properties, restaurants and museums including collaboration with a range of other creative professionals. We have an inquisitive approach to material exploration resulting in versatile designs and applications; from large outdoor sculptures in the public realm to residential wallpapers. Our versatile, hand drawn approach to designing pattern allows our pieces to work with their context. We use a combination of traditional and contemporary methods to apply our designs to a range of materials such as paper, textiles, wood or metal, as well as investigating innovative techniques such as casting in concrete or layering designs within fibre glass. We work all over the UK, with most of our projects in Scotland. We are currently looking into expanding into global markets. Based in Glasgow, Scotland we work all over the United Kingdom and are looking to grow in international markets. Every project comes with it’s own requirements, but due to our experience we are able to manage projects effectively and professionally in any location. Bespoke Atelier’s mission is to bridge the gap between architects, interior designers and artists by creating bespoke artwork and patterned design solutions that are embedded in the building or space. By using innovative design approaches and fabrication methods we create integrated interventions. We work closely with the client, members of the design team and end users engaging with them throughout the design process to provide an artistic approach that is rooted in its context. Yvonne Elliott-Kellighan completed her Degree and Masters in Textile Design at The Glasgow School of Art in 2011. She founded Bespoke Atelier after graduating and since then has been working on a range of exciting surface design projects. 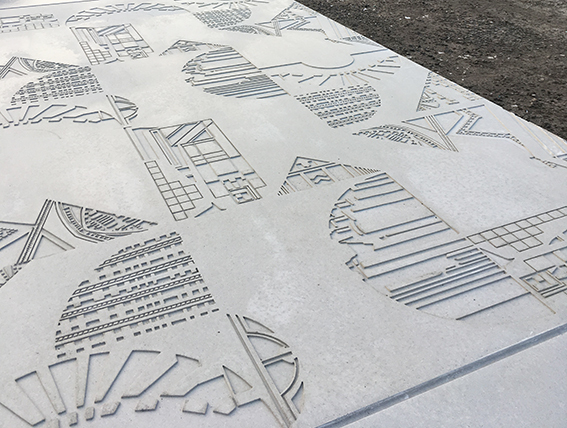 Yvonne has recently completed a range of outdoor commissions including bold sand-blasted patterns in Caithness stone whilst currently working on the design of a children’s water feature in Inverness and a public brick patterned plaza in Glasgow. Yvonne’s designs flow between exterior and interior spaces having recently created Glasshouse, a first in-house collection of fabrics and wallcoverings inspired by the Glasgow Botanical Gardens. Marion Parola studied at L’Institut Supérieur des Arts Appliqués in Nantes (France) and then completed a Degree and Masters in Textile Design at The Glasgow School of Art in 2011. She met Yvonne whilst studying and co-founded Bespoke Atelier shortly after graduating. Marion has recently completed a range of geometric and botanical patterns for the facade and interiors of a large building in north Glasgow working with manufacturers based in Scotland and Germany. In 2016, she was offered a residency at Hospitalfields in Arbroath where she developed new fabrication methods to implement her pattern designs onto fibreglass. Marion believes in collaborations with manufacturers, architects, interior designers and passionate people. Here at Bespoke Atelier, we are passionate about our industry and doing our bit to help others get into it. We offer internships for graduates that are practical, focused and offer valuable experience for them to take forward. If you are interested in interning with us, please send your CV, cover letter and a portfolio of your work to intern@bespokeatelier.co.uk.